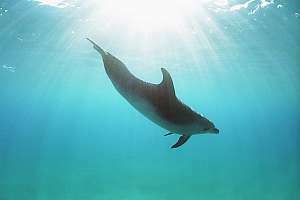 Dolphins belong to the most adorable creatures in the sea. 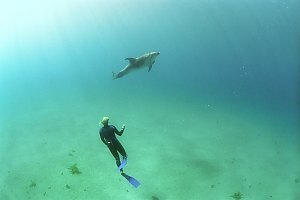 They are intelligent, friendly, powerful, graceful and often interested in our presence. 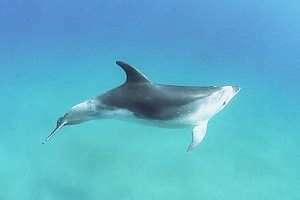 But dolphins need large territories to roam in for finding enough food. 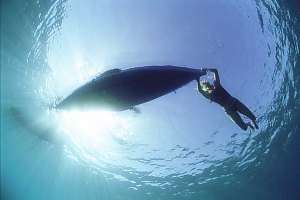 When food becomes precious, when for instance the sea becomes sick, they have to spend too much time hunting for food and too little time playing. They become stressed and avoid human contact. 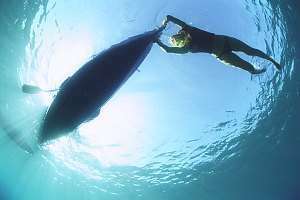 Photos of wild dolphins under water therefore are precious gifts from equally precious moments in the sea. 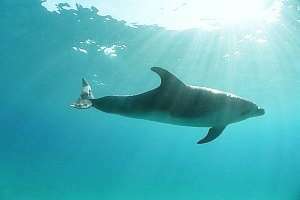 f034301: female bottlenose dolphin (Tursiops truncatus) f034302: a female bottlenose dolphin (Tursiops truncatus) facing the sunlight in clear water. 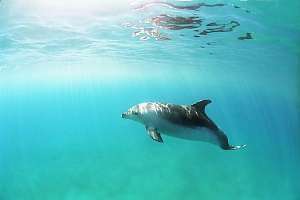 f034303: A mother bottlenose dolphin (Tursiops truncatus) approaches the photographer in a threatening pose to defend her calf in the background below. f034304: a young female bottlenose dolphin (Tursiops truncatus) has gathered just enough courage to get this close to the photographer. 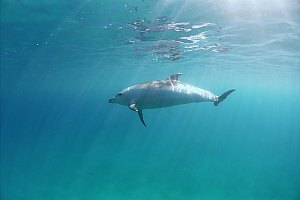 f034305: a large male bottlenose dolphin (Tursiops truncatus) comes to almost touching distance, showing his prowess, speed and power. f034306: a large male bottlenose dolphin (Tursiops truncatus) posing in cathedral light for the camera. f034307: female bottlenose dolphin (Tursiops truncatus) f034312: a couple of young male and female bottlenose dolphins (Tursiops truncatus) playing and courting. f034308: People have a close affinity with dolphins, which is not always reprocicated. 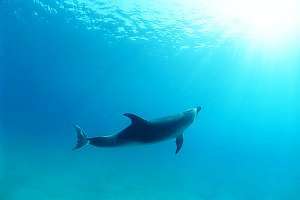 Here a snorkeldiver has descended to meet a shy female bottlenose dolphin (Tursiops truncatus). 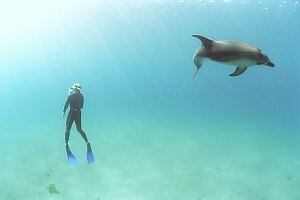 f034309: snorkeldiver and female bottlenose dolphin. 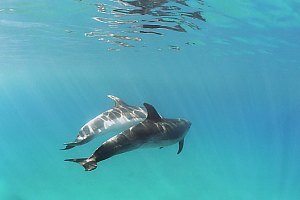 f034310: a swimmer and a snorkeldiver line up to meet a pod of bottlenose dolphins, two of which have decided to make a close pass. 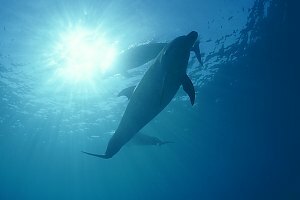 f034311: meeting dolphins underwater is exciting because they too seem to be interested. 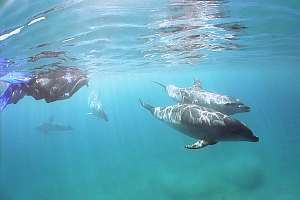 Here two bottlenose dolphins (Tursiops truncatus) come for a close pass. 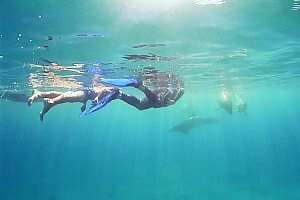 f034314: swimmers and canoeers seen from a shark's perspective. f034315: out of their kayaks, swimmers are not safe from sharks. f034316: a swimmer is pulled along by one of the kayaks. f034317: a swimmer pulled along by a kayak.